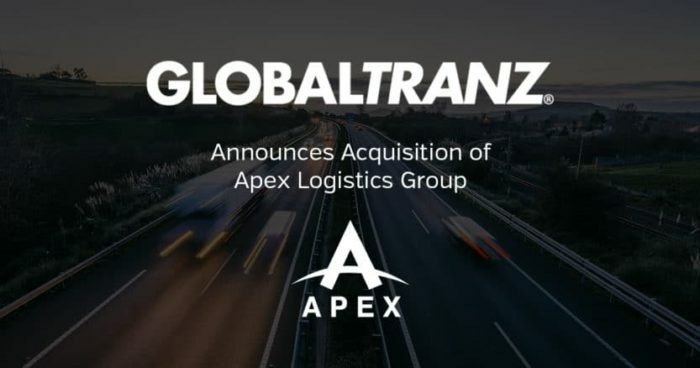 PHOENIX – December 7, 1017 – (BUSINESS WIRE) – GlobalTranz Enterprises, Inc., a leading technology-driven freight management solution provider, today announced it has acquired Apex Logistics Group, a prominent enterprise shipping and logistics company. The acquisition further solidifies GlobalTranz’s position as a top freight brokerage firm and increases the company’s market share in third-party logistics (3PL) services. Apex Logistics Group has been operating successfully for over 10 years. The company currently serves an extensive client base, including Anheuser Busch, Del Monte, JR Simplot, Kroger, Niagara, Sysco and US Foods as a result of its expertise in temperature-controlled and truckload freight services. Apex’s strong freight brokerage operation and deep industry experience in concert with GlobalTranz’s innovative technology and logistics solutions will further enhance the value proposition for shippers. Apex Logistics Group is GlobalTranz’s fourth acquisition in 2017, expanding its footprint and capabilities with the additions of Milwaukee-based Global Freight Source, Minneapolis-based Logistics Planning Services and Richmond-based Worthington Logistics. GlobalTranz recently announced its 2017 Q3 earnings; reporting record revenues, up 42% year over year. Apex logistics is a privately-held, Utah-based logistics company specializing in LTL, full truckload, temperature-controlled transportation and warehouse management services. Founded in 2003, Apex Logistics offers value added freight management services that drive efficiency, reliability and cost savings for businesses. GlobalTranz is a technology-driven freight brokerage company specializing in LTL, full truckload, third-party logistics and expedited shipping services. GlobalTranz is leading the market in innovative logistics technology that optimizes the efficiency of freight movement and matches shipper demand and carrier capacity in near real-time. Leveraging its extensive freight agent network, GlobalTranz has emerged as a fast-growing market leader with a customer base of over 25,000 shippers. In 2017, Transport Topics ranked GlobalTranz as the 13th largest freight brokerage firm in the U.S. For more information, visit permissible-script.flywheelsites.com and follow us on LinkedIn and Twitter @globaltranz.